Duke had a “remarkable record” as a World War II fighter pilot, flying Spitfires over France and later, North Africa and Italy. He became a test pilot for the Hawker Aircraft Corporation in 1948. He held the world air speed record in 1953 flying a Hunter but had to retire as a test pilot in 1956 following a serious accident. Nevertheless he continued flying to the day he died, aged 85 – and not as a result of an air accident. He wrote several books including Sound Barrier, Test Pilot, The Crowded Sky and The War Diaries of Neville Duke; and even endorsed a card game named after him in 1955! 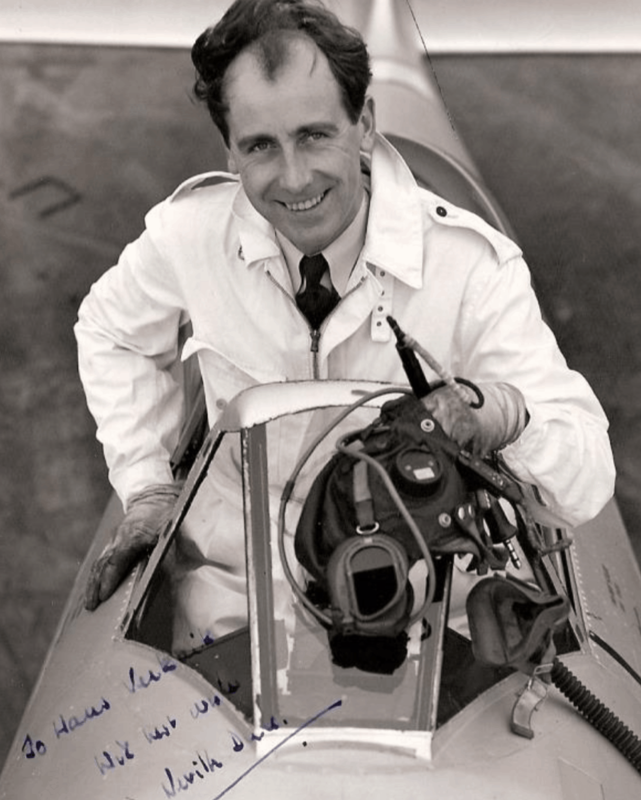 The test pilot Neville Duke, who has died aged 85, was an icon of the New Elizabethan Britain of the 1950s. At the dawn of the television era, when media personalities were born within black and white newsreels, picture weeklies and smudgy tabloids, the former Royal Air Force squadron leader had the celebrity of sportsmen such as Stanley Matthews, movie actors such as Dirk Bogarde, or the conquerors of Everest. It was a form of celebrity almost unimaginable now, built not only on Duke’s performance as a test flier but on his record as a wartime fighter ace. Duke was far from being the first or only test-pilot-as-hero during that time, but as the country edged out of postwar austerity, his style and achievements singled him out. His understated public persona – in contrast perhaps to American equivalents such as Chuck Yeager – suited the public mood. Duke may have been a technologist doing an extraordinarily hazardous job, but he also provided an ideal image for the domestic aviation industry. In those days the annual Farnborough air display, in a pre-multinational era when it showcased only British aircraft, was a part of middle England’s summer season. Duke’s aircraft was the Hawker Hunter jet fighter. He took the machine from its trials, as the Hawker P1067 in July 1951, to a world speed record of 727.6mph in September 1953, achieved in the impeccably English setting of Bognor, Littlehampton and Worthing, just three months after the Coronation. It was a time when the Eagle comic’s Dan Dare Pilot of the Future – RAF fantasia relocated in outer space – fuelled those New Elizabethan dreams of sound barriers, supersonic flight, new empires and interplanetary travel. Duke even showed up, dressed for the part, in the Eagle’s “Heroes Of Today” slot. In 1951, the white-overalled pilot had dispensed with old-style leather flying caps for what became part of his trademark, an American white helmet, born of gridiron football, pre-astronaut 1950s modern and soon adopted by teenage ton-up motorcyclists on their Tiger 110s. 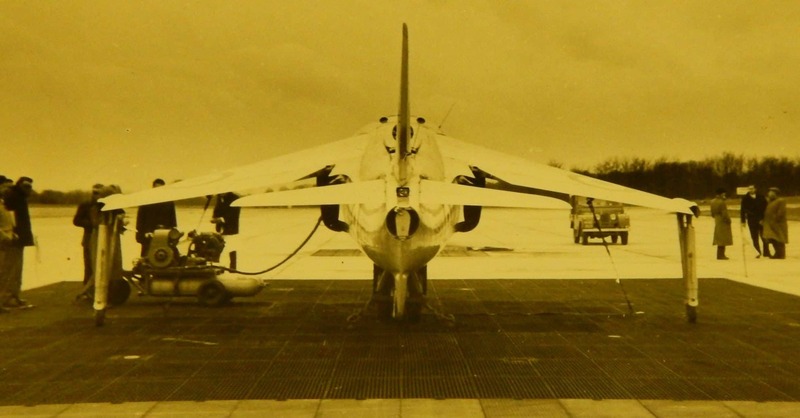 In the immediate postwar period, the British fleetingly held a world lead in jet technology. But soon the power of the US made itself felt. In October 1947, Yeager piloted the rocket-powered Bell XI through the sound barrier and the F86 Sabre jet fighter achieved the same in a shallow dive. In 1950 the Korean war began, and, in a defining moment, the Labour government began its rearmament programme, feeding more money into the aviation industry. Duke took over as chief test pilot at Hawker in 1951, following the death of “Wimpy” Wade in a Hawker P1081. By then both the US and the Soviet Union had high-performance frontline fighters – the F86 Sabre and the MIG15 respectively. The RAF, meanwhile, did not fly its own obsolete Gloster Meteor jet fighters in Korean war combat. Thus were the Hawker Hunter, conceived in 1948, and the Supermarine Swift – together billed as successors to the Hurricane and Spitfire – heralded as a solution to the RAF’s problems and a fillip to national pride. The Swift flopped, except as a star of David Lean’s 1952 feature film about intrepid test pilots, the Terence Rattigan-scripted The Sound Barrier. The Hunter did not flop, and what set the seal on its success, and Duke’s fame, was his performance at the 1952 Farnborough show. Standing in the aircraft park, Duke had watched as the test pilot, John Derry, and his navigator, Anthony Richards, broke the sound barrier in their black de Havilland Dh110. Then catastrophe ensued. The jet disintegrated, its crew perished and 28 spectators were killed by flying debris. Duke was educated at the Convent of St Mary and Judd School in Tonbridge, Kent. In the 1930s, as air shows toured a country newly intrigued by flying, the schoolboy Duke took several flights with Sir Alan Cobham’s flying circus. He enlisted in the RAF as a cadet in June 1940 and later joined 92 Squadron, flying Spitfires. The first plane he shot down was a Messerschmitt Bf109 over Dunkirk in 1941. Later that year he joined 112 Squadron, initially flying American Curtiss Tomahawks with the Desert Air Force. Later he flew the Curtiss Kittyhawk, then returned to later marques of the Spitfire. Duke had two spells as a flight instructor, but as a fighter pilot his spectacular record meant he ended his war in North Africa and Italy as the RAF’s leading ace in the Mediterranean, having destroyed 28 enemy aircraft, and having spent a spell with Italian partisans after he was shot down. In 1945 he became a Hawker test pilot and in 1946 joined the Empire Test Pilots School in England. That June he was seconded to the RAF High Speed Flight, set up for development work – and to break the world air speed record. That September the aim was briefly achieved when Group Captain Teddy Donaldson flew his Meteor at 615.78mph. Jet aircraft incarnated the future. Landing in Prague that June in a Meteor, Duke was met, and mobbed, by a 150,000-strong crowd. In 1947, he married Gwendoline Fellows. The following year he left the RAF and joined Hawker as assistant chief test pilot, remaining an officer with the Auxiliary Air Force. In 1949-50 he achieved world records on flights between London and Rome, London and Cairo and London and Karachi. In July 1954, the Hunter entered service with the RAF. It was beautiful, but, within cold war logic, late, with a performance little better than the F86 which the Americans had been operating since the beginning of the decade. Yet it was a major sales success, with nearly 2,000 produced for many countries, including Chile. It was a flight of Hunters that strafed Santiago’s Moneda palace during the 1973 Pinochet coup, and the fighter was still in service with some air forces in the 1990s. Its contours are echoed in the contemporary American B1 bomber. In 1956 Duke left Hawker, after a forced landing led to serious and long-lasting back injuries. Yet his subsequent career in test flying continued into the 1990s on light aircraft. From 1960 to 1982 he ran Duke Aviation and subsequently worked as a consultant. He published six books, including Sound Barrier, Test Pilot (both 1953), the anthology The Crowded Sky (1959) and The War Diaries of Neville Duke (1995). He received many awards and decorations, including the DSO, OBE, DFC and two bars, AFC, MC (Czech) and fellowship of the Royal Aeronautical Society. His hobbies were yachting – and flying. Forty years on from his 1953 world record, he co-piloted a re-creation of the flight in a two-seater Hunter. The Hunter, he observed that day, was the love of his professional life. A decade ago, interviewed for a BBC2 documentary The 600mph Men, he painstakingly described the technique of flying the Hunter into the sound barrier and coming out across an airfield at 720mph. “Piece of cake,” he concluded, in the language of another time, and smiled. Hours before his death, Duke felt unwell while flying his aircraft with his wife. He landed safely. Gwendoline survives him.